Many old cameras do not have a built-in exposure meter. Usually that's not a real problem as the old sunny-16 rule (see below) still applies. To estimate the exposure gets more difficult indoors, during sunsets, heavy rains or overcast days so an exposure meter is indeed a very handy tool to have. 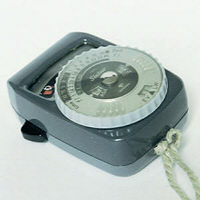 Before the electronic era, people would calculate the correct exposure using one of the many exposure tables. These table usually take many variables into account: time of day, time of year, weather conditions, subject etcetera. An example of those charts is listed below. 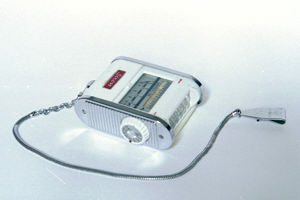 One of the oldest, still existing manufacturors of electronic exposure meters is the German Gossen. 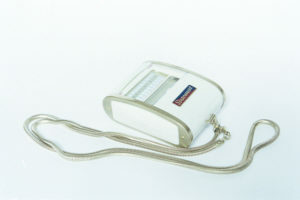 They have produced many meters and the meter design shows much about the time the meter was produced. It's not difficult to tell which meter was produced in the 1950s, 1960s, 1970s etcetera, actually one of the nice things about collecting exposure meters. Gossen has a great web site (see links) where they show all their meters. 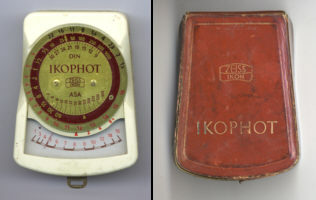 They have PDF of most manuals of the old light meters online. They are also great for whenever you would like to have a non-listed manual for your meter, considering that they will not make money of the old meters anymore. Just ask them, they are very friendly, that's what I call customer service! My work-horse exposure meter. It's big, it's heavy but it's sturdy and goes on forever. It's made to work with now obsolete mercury batteries but it seems to be pretty acurate with never alkaline 625 batteries, you might have to recalibrate using the screw at the back but then it works. In the mean time I bought three of them as they cost next to nothing. Have never figured out how to use this one, it might be broken, but it's the coolest exposure meter I own. They're easy to find used and they're cheap. Kombinierter Präzisionsbelichtungsmesser - zeigt bei guten Lichtverhältnissen durch Zeigerausschlag den Lichtwert an, auf Grund dessen dann mit einem Blick die Belichtungszeit für alle Blenden von 1,4 bis 36 abgelesen werden kann. Wenn bei Nachtaufnahmen oder in dunklen Innenräumen der Zeiger wegen scwachem Licht nicht mehr ausschlägt, so ist durch den eingebauten optischen Messer noch eine einwandfreie Weitermessung möglich. Photo- und Kino-Angaben in einem Messer auf getrennten Tabellen. Nothing screams "1960s" louder than a kidney-shaped table, the beatles and this exposure meter. This meter works by using the eye to find the correct exposure. You look through a tube in which a row of letters is glued. The light coming in through the other end of the tube is only bright enough to see a certain number of letters. The darkest letter that can still be distinguished is then looked up on the meter's table to find the corresponding correct exposure. Instructions for Use. Setting or Sight. Place the Justodrem close against the eye and slide the outer tube in or out until the letters appear sharp when looking through the meter. Testing Light. Having adjusted for your sight as above, point the Justodrem to the subject. Starting from the brightest letter A, decide which is the faintest letter that is Readable (Test should take 5 to 10 seconds). Observation of this letter forms the test. In the column (on the outside of the meter) under this letter will be seen the various times of exposure (black) for every stop (red). Speed of Film or Plate. Without Filter : Turn the ring (under the eye-pice) to bring the red arrow opposite the Scheiner No. of the plate of film being used. With Filter : Instead of the arrow, set the factor (2, 4, or 8) of the filter opposite the Scheiner No. Before they invented electronic exposure meters and before everyone could afford such meter, people had to guestimate the correct exposure or use one of the numerous exposure cards available. It's quite easy to use one but it needs some time before you have calculated the correct exposure. It's still extremely accurate however and when using a large format camera on a tripod, it will take ages before you are ready to take an exposure anyway. 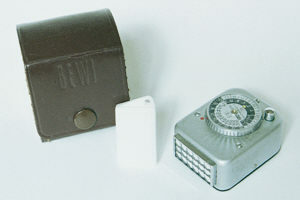 A market overview of 1985 exposure meters show many different yet similar exposure meters. Always nice to have a clear overview of what the different meter can do, especially when they can now be had cheaply on the second hand market. 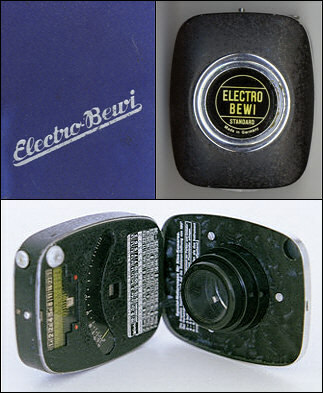 Be careful to buy a light meter with a currently still available battery. Mercury batteries are hard to find now and will be impossible to find in the near future. The newer 1.5 Volt replacement batteries might work accurately but this is not guaranteed. So be warned. The sunny 16 rule is a very basic and easy to use rule that tells you the correct exposure. You should not really use it for slides but for negative film stock it works pretty well. Of course, 1 / 100 at f=16 is the same as 1 / 200 at f=11 and 1 / 400 at f=8. Using the standard shutter speed settings on your camera this will usually become 1 / 125, 1 / 250 and 1 / 500 with the difference working out minimal for negative film. For more information and more precise tables, try the search engines for "sunny 16 rule". A small but interesting exposure meter and camera collection. 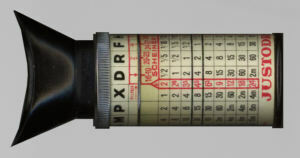 Website of an avid exposure meter collector.